This rug was EXACTLY what I wanted. 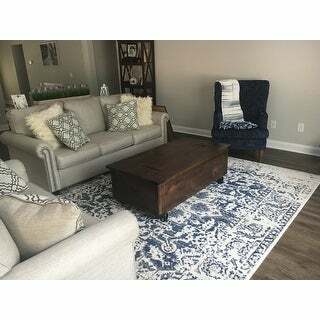 True navy vs the teal/aqua that was pointed out on other reviews of rugs that looked like navy in the picture. 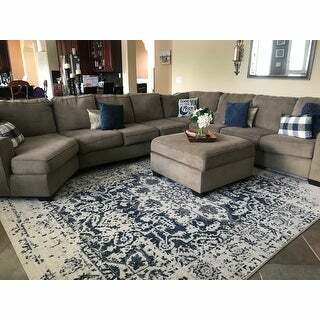 Thank you to all who posted your reviews to help me make the decision to buy this rug. You were spot on! 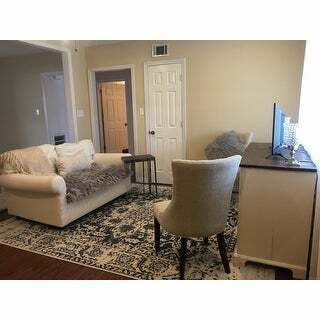 This 8x10 rug is in the master bedroom under our queen bed (also purchased at the same time from Overstock, which was another fantastic buy!) and is right up to the wall. I chose to buy the bigger rug due to the other customers wishing they would have bought a bigger size. I like the bigger size because it gives a good amount of rug on each side of the bed. There was no damage, rolled it out and set a couple of books on the edge to flatten it out. Viola! Gorgeous rug in place! It did have a little bit of a smell, but we have a ceiling fan in the room so it cleared up pretty quickly. I chose not to put a pad underneath based on the other reviews and this would also be my recommendation because it has a decent pile with no shedding at ALL. 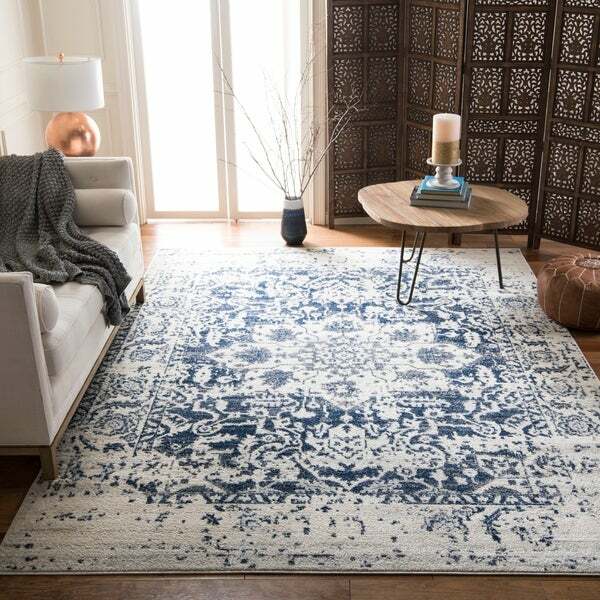 This is my first order from Overstock and am still amazed at the price for the quality of rug I received. Thanks Overstock!!! I was not sure if this rug would work in my dining room, but it turned out perfect. The rug is a nice size and the pile is nice. The colors were as expected. Would recommend. Love the colors in this rug! I've had this rug for over a month and I still love the way it looks in my dining room. The rug came rolled around a thick cardboard tube with the underside facing out. We re-rolled the rug topside out and left it overnight to remove curling edges. In the morning, we cut a thin rug pad to fit (2" shy on all four sides), unrolled the rug and placed it on top of the pad. Then we smoothed out the few wrinkles that had appeared. A couple wrinkles were stubborn, but they have relaxed over time. I used rug grips on all four corners because we frequently walk through the dining room. Our high-top table is 42" x 42". All four chairs can be pulled out away from the table and they remain on the 8 x10 rug. The rug is neutral enough that I can add splashes of color with napkins, placements and flowers. The overall pattern is interesting and timely without being trendy. 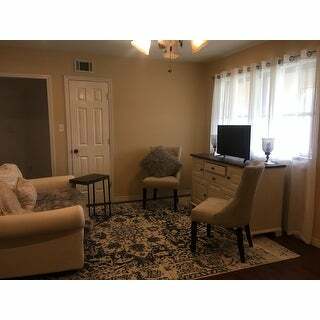 It was a win-win-win purchase for me; the price was right, delivery was prompt, and the rug added just the right touch to our dining room. 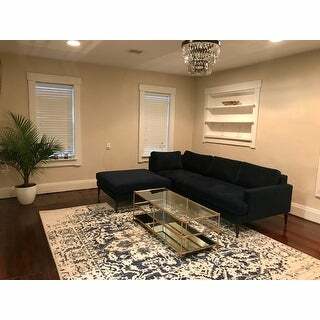 The Medallion Cream/Navy Rug is a beautiful rug. It is kind of thin but it seems to be a good quality rug. The colors are true - it is cream and navy with some gray. It is exactly what I was looking for. 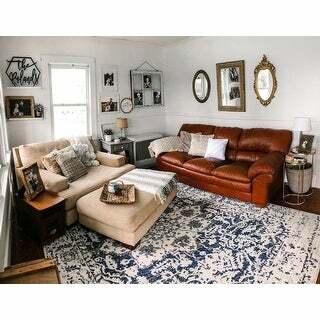 I'm not an online shopper...but after searching for an area rug for 6 years, I finally gave in and I'm glad I did! I was nervous the navy blue might be lighter in person, but it not. The picture is very accurate and true navy. The rug is a bit thinner than I was expecting. It's very soft on the foot. Very happy with my purchase. I love this rug! It is exactly what I was looking for. It is soft under my feet and has gorgeous colors makes my room look 100% better. I can’t wait to finish decorating my place in this color palette. I’m so picky too. I looked for rugs for so long and finally found my perfect one and I am super picky! The darker blue in the rug matches the color I painted my tv stand perfectly ! LOVE THIS RUG. I absolutely adore this rug. It's soft and the color is beautiful. It looks exactly as I had expected. It looks lovely in my living room. Highly recommended! Great are rug. Colors are as shown in the Overstock App. This rug brought my little space together making it look so cute! Thick enough that you don’t need a pad. Fast shipping, no smell. Very pretty rug. The color is what makes it. It is a rich navy color. The design is really nice and the quality is pretty good, especially considering the price. The cream is a true cream, it doesn't have a dingy or grey-ish tint, which is an issue I have encountered with some other rugs. Looks just like the picture online. Beautiful addition to my living room! I absolutely love this rug. It looks so beautiful in my living room. I am a super picky person and it literally took me 3 months to decide on a rug. I couldn't be happier with it. It shipped quickly and the quality is great. 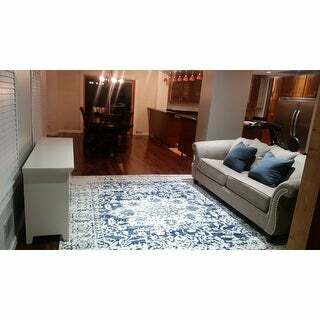 This rug is of superior quality and was the perfect color for our living room. I was absolutely shocked we got this quality rug for the very low price we paid! Arrived early and packaged securely. I also purchased the warranty since the rug was so much less than I planned to spend. This has been what I’ve been looking for. Love the colors of blue, grey and cream. Looks great with my furniture in my living room. Had some wrinkles but went away after a few days. Will definitely order from Overstock again. Came quickly and packed well. Beautiful! Love it although was too big for bedroom I hoped to use it in to offset my new bed but substituted it in another bedroom which was bigger. 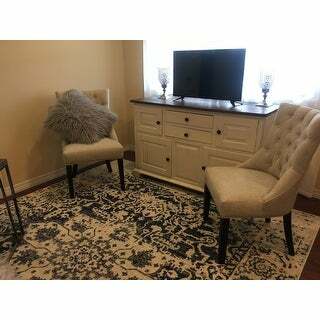 The fit is okay now and I am going to just order another rug in a different color for the smaller bedroom. Would definitely recommend! I bought this as a wedding gift for my niece. They lived it so much that they took pictures and put it up in Facebook thanking me because it’s perfect! I love this rug. THe colors are like those displayed. It goes well in my formal living room. I like that it came in different sizes. The pattern on the rug is unique. Love this rug! 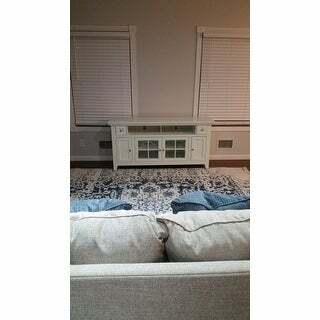 It was perfect for my family room. Lays very nicely immediately! Love these rugs! The colors are so beautiful and the quality is great. They look great with my cream sectional and my dark floors. I also got the runners to for my hallway to match and the runner is perfect as well. "would u call the navy an indigo blue , dark blue, or black blue??" This blue can best be described as dark blue. Please note that colors may vary due to dye lot variance in production. "Looking for this rug but I think I might need a 9/12 since I have a King size bed?" "How do you clean this rug, I must have missed it if it's there?" The label on the back of the rug says: "Vacuum regularly. Rotate occasionally. Remove spills immediately; blot with sponge or damp cloth. Avoid water saturation. Avoid direct exposure to sunlight. For hard to remove stains professional cleaning recommended. Use of a non slip rug pad is recommended." I hope that helps! Thank you so much, it absolutely helps. Honestly, my toddler decided to draw a big stripe of pink and green crayon, and a Mr Clean Magic Eraser got all traces up! I’d be willing to bet most stains would come up, too!! "does this rug have a shiny sheen to it? not fond of shiny." No, it's not shiny. Love this rug! 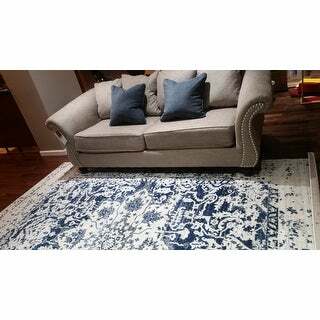 I purchased this rug and I think, due to the jute in the material composition, it doesn't appear shiny. Hope this helps. "Can someone describe the material it is made of? Is it too rough for children? " Not too rough at all! It's actually quite soft. My toddler plays on this rug all day long. Super Soft! Love the feel of this rug!! "would this rug work in a kitchen do you think?" The rug could work well in a kitchen situation.